A user is also known as an answering agent. When a chat request is sent, it will be routed to the specified list of user/s. already created “Demo” group, and will be a part of the “Demo” page. You can access this page by going to: https/enablingchat.com/companyname/Demo. This is the answering agent’s name that will be displayed during the chat conversation. Email Address: Email address of the answering agent. Skype Address: This is the Skype address of the agent. 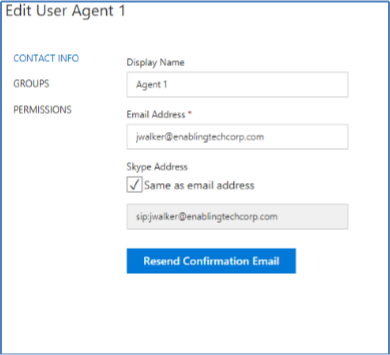 If the Skype address is the same as the email address, then check the checkbox “Same as Email”. Resend confirmation email to those users that need access to the dashboard. Groups Tab: This section will display all groups/departments that the user can be assigned to. Toggle the switch on to map users to that group. Permission Tab: This section will display will allow you to set different admin access for a user. Admin can have access to edit Users, Groups, or Pages. A user can also be exempt from a user’s license count by selecting the “Is Exempt Admin” check box. When you are finished creating a User, click the “Save” button. Your User will save and the popup window will close. You can click “Cancel” at any time to go back to the Admin Dashboard. Edit a User: To Edit a User, double click on the user’s name under the Users tab. Delete a User: To delete a User, simply click the button. You will be prompted and will need to verify your deletion.